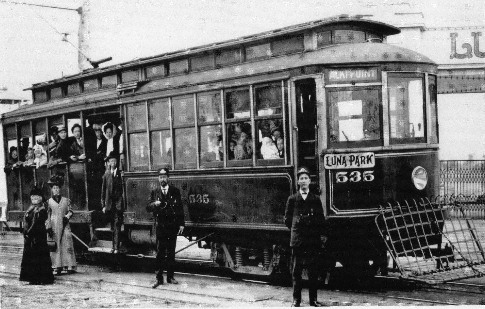 Well, we’re going to be putting the web site back together again after it crashed and came across this great pic of the old West Seattle Luna Park Trolley, so here it is. Luna Park was a wonderful old amusement park located many years ago at the tip of Duwamish Head here in West Seattle. It featured the longest bar in Seattle and was closed down in the teens as Seattle went on a temperence movement due to too many young ladys losing their virtue there during those wild years. Ten years later it caught fire and burned down to the waterline. You can still see the pillings during low tides.